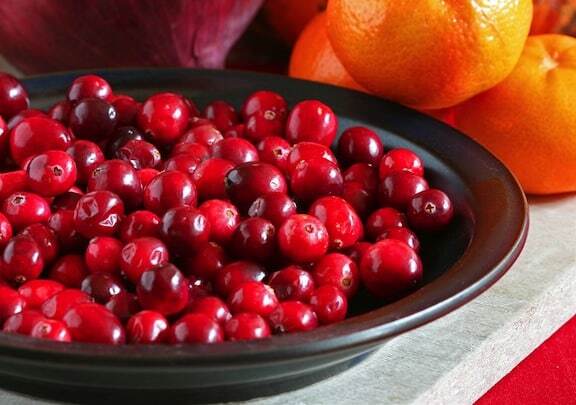 Packed with nutrients, cranberries are healthy and delicious, making dishes pop with flavor. They also can take many forms: juice, sauce, jam, dried and of course, fresh. When fresh, they pack a punch of tartness that overpowers their sweetness, but if you can get over the bite, it’s worth it. This “superfruit” is full of antioxidants and really good for you!Harvested between September and December, cranberries grow on short, thin vines and also bloom flowers and ‘spikes.’ They start out white, and as they mature turn to their better known deep red color. 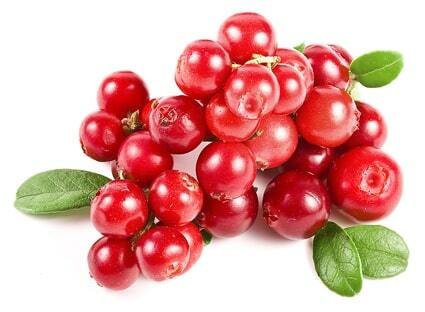 Almost 95 percent of cranberries grown are used for fruit juice; the other 5 percent are sold fresh and raw. 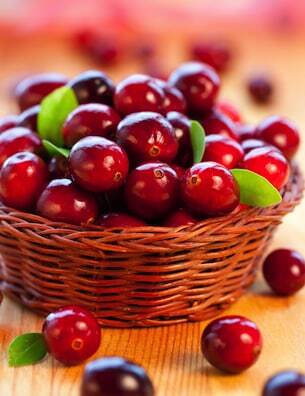 Cranberries have been used to treat and prevent ailments and disease for a long time. They are best known for combating urinary tract infections because of their ability to fight bacteria. And now research has shown that they contain a compound that is an anti-adhesion force against bacteria. All different kinds of bacteria! Here are a few things cranberries can prevent and help: gum disease, cavities, bone strength, kidney stones, E. coli, cholesterol, cancer, blood cots, stomach problems such as ulcers, and heart disease. Cranberries can help with many health conditions but you have to watch out for added sweeteners, especially in juices, sauces, and jams. Although it can be bitter, try opting for the unsweetened juice instead of the “cranberry cocktail”. Get juice that is as close to 100 percent juice that you can. And even if you’re eating sweetened cranberries, you are still getting the good stuff from them, just make sure to pay close attention to and follow the serving size, otherwise it’s going to waste. Start buying fresh or frozen cranberries to make your own juice, sauce, and jams—that way you control the sweetening, and you can use more natural types like agave nectar. The good stuff: Naturally fat free, Vitamin C, A and K, Calcium, Magnesium, Phosporus, Potassium, Carotene, low sodium. Beyond the standard uses, cranberries can be used in a variety of ways: give a surprising flavor to soups and stews, toss on top of a green salad or include in a fruit salad, add to the blender for smoothies. I’ve even been known to throw some on top of tofu or tempeh with a side of mashed potatoes and green beans. You can find more recipes by putting ‘cranberry’ in the VegKitchen search box. Nota.cran berries lo dulce que entrega este producto es recomendable para diabeticos,independiente a los beneficios que aporta.